Full Title: Why Does Anne Boleyn Haunt Us So Much Nearly 474 Years After Her Death? As I sit snowed in by the second major nor’easter to hit the northeastern United States in 5 days, it gives me time to think about Anne and why she still has an effect on some of us so long after her death. Why Anne? There were plenty of other queens to occupy our thoughts and fantasies, most of their lives having much happier outcomes than Anne’s did. She was not a long-reigning queen like Victoria, nor a woman renowned for her power, wealth and beauty during her own lifetime, like Eleanor of Aquitaine. I can only speak for myself, but I have some thoughts on the matter. In my case, Anne has fascinated and haunted me since I first heard her story – probably as a child or pre-teen. Being a rather scrawny girl with dark brown hair and brown eyes, I was far from the feminine ideal of the buxom, blue-eyed blonde who seemed to be every man’s fantasy. In the fairy tales we all hear as children, the beautiful, blue-eyed blonde heroine always ends up with the handsome prince. The villainesses are ugly, dark-eyed brunettes who are vindictive and jealous of their much fairer counterparts. They throw everything possible in the heroine’s path but her goodness, sweetness and beauty always wins in the end, leaving them bitter and frustrated at best. Yet here one of the most powerful men of his time, Henry VIII of England, was obsessed by a woman who was described by Venetian diplomat Francesco Sanuto when he saw her in Calais as having a “bosom not much raised”, “swarthy complexion”, and “eyes which are black and beautiful”. So maybe there was hope for me after all! Another thing that I’ve always admired about Anne was her feisty personality – she actually had the gumption to deny the powerful Henry VIII his most ardent desire for seven years – until she was on the cusp of having the relationship on her own terms as his wife and queen. Maybe part of Anne’s tragedy is that what Henry saw as desirable in a potential mistress was the exact opposite of what he wanted in a wife – someone who was meek and accommodating. The fact that he couldn’t have her just made him desire her more. I’ve always hoped that sometimes Henry missed Anne after she was gone, even though history suggests otherwise. I’ve never been able to figure out how Henry could have ordered the death of one he had once loved as passionately as he loved Anne. But then, as the saying goes, the opposite of love is not hate but indifference, and I guess that Henry’s passion had turned to a new direction. I’ve never been able to figure out why history views Jane Seymour so favorably and Anne so negatively. Either Jane was a spineless wimp who allowed her father, brothers and other members of the anti-Boleyn faction to manipulate her for their own benefit, or she was a cold, calculating woman who hid behind a goody-two-shoes facade in order to destroy her rival. At least with Anne you knew what you were dealing with! But then, as the saying goes, history is written by the victors. Much has been made of how Jane was able to reunite Henry with his eldest daughter, Mary. However, the fact remains that Mary was forced to acknowledge Henry as the supreme head of the Church of England and her beloved mother’s marriage to be “by God’s law and man’s law incestuous and unlawful” before Henry would her back to court and back into his life. Then he made a self-serving comment to her about she and the Duke of Richmond (her illegitimate half-brother) were rescued from “that poisonous strumpet” (meaning Anne). This betrayal of Katherine of Aragon’s memory would haunt Mary for the rest of her life. companion to go on the tour with her, and my parents convinced me that after I started working I might not get such an opportunity again. I agreed to go, and on my first morning there the group visited the Tower of London. Green. I actually felt my hair stand on end, knowing that I was standing on ground that Anne had walked on so long ago! Since then, I’ve taken every possible opportunity to travel to England, visiting the Tower of London (once on May 19th, Anne Boleyn Day! ), Hever Castle, Hampton Court Palace, Blickling Hall (which is on the site of Anne’s probably birthplace, but, unfortunately, not the original building), and every other possible site pertaining to Anne, Henry or the Tudors. I honestly believe that my parents came to regret talking me into taking that tour! On October 29th I attended a psychic event at Hever Castle which included dinner in the Astor Wing and overnight at the castle. Connections there led me to the Anne Boleyn Files and the Anne Boleyn Experience 2010. I’m really looking forward to meeting like-minded people who are as passionate about Anne and Tudor history as I am! I guess that when I go to dinner in the main dining room at Hever Castle wearing my Tudor reproduction dress I’ll feel like I’ve come full circle! Does anybody know if there are any copies of tapestries that Anne worked on. I would love to make a reproduction in either cross stitch or embroidery. I know that Tudor ladies spent a good deal of time sewing and I would feel just like one of them if I was making a tapestry from that era. Hi Lori, In response to your question of Anne Boleyn’s embroidery, there is a piece of her work at The Tower of London. I am a needlework nut too and couldn’t find any other piece she did. If you go to Flickr type in Tower of London: Anne Boleyn Needlework. I did manage to buy a tiny cross stitch kit at the Tower of London’s gift shop of Anne Boleyn and Henry VIII. If you go to the Historic Royal Palaces website and the Tower of London gift shop, the kit should be listed. Hope this helps. I went with Claire and the Anne Boleyn Files tour this past May. If you can go, don’t miss it. It was incredible! I enjoyed your article alot. I did have a question pertaining to ur psycic experiences. Did they make contact with anne? how was the atmosphere? could u feel any old souls in the room??? I think Anne and her part in the ultimate royal love triangle fascinates us till is because it is so raw, human and universal. We can all relate because at some point in our lives we’ve all been in the shoes of at least one of the participants, it was human drama at its most heightened. 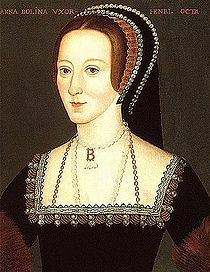 Anne fascinates me still because like her I don’t follow the herd, I march to my own beat and do my own thing on my own terms but if there was an Anne Boleyn v. Katharine of Aragon grudge match I am team Aragon for life however I have respect for Anne Boleyn. She was put in an untenable position, Henry saw her, decided he wanted her, had Wolsey put a stop to her relationship with Henry Percy (I think he was her true love) and tried to make her his mistress after his attentions to her sister destroyed said sister’s reputation forever. She had self-esteem and self-respect and refused to let Henry treat her like a willing skank. She tried to protect herself by demanding marriage in a situation where the smart money would have been on Henry forgetting about her but then Henry went rogue and threw over his wife, child and country into years of pain and turmoil. I believe Anne tried to do the right thing for herself but in the end it didn’t work out for her. Henry did her wrong on an epic scale just like he did KoA and aside from his daughters she was the most innocent and tragic victim of his tyranny as she was the one he loved the most ardently. I agree with you, Anne was a very different queen and was true to herself, in that she did not change and become the submissive wife that Henry VIII obviously expected. We’ll never know the real story of Anne and Henry’s relationship, but I see it as a meeting of minds and a great passion. They were able to discuss theology, art, architecture etc. and Henry took notice of what Anne said. She was an amazing woman. Anne Boleyn was mistreated by those around her especially her husband the King. She deserved better than what she got out of life. It is a shame that she did not get to see her daughter grow up and become queen. Henry VIII was so obsessed with having a son but it never dawned on him that the strong daughter of Anne Boleyn would rule England successfully for over 40 years. Elizabeth is the Tudor monarch most remembered next to her father and not Edward. Anne haunts us because of her tragic demise, had she been allowed to live may be retiring to a nunnery or just leaving court and happily marrying some one else, settling down to a comfortable old age the romanticism associated with her would never have been, it is interesting to imagine how long she would have lived, she would have seen her daughter become Queen and would have gloried in it, but it wasn’t to be, her fascination lies in the many unanswered questions about her, what did she really look like? How old was she when she died? Did she commit adultery and with her own brother? Add to that the brutal way she died and she immediately becomes a fascinating persona, tragic ,romantic rather like Ophelia it’s rather like a Greek Tragedy, the autocrat Henry wielding power and Anne the woe begone wife forsaken because she couldn’t bear a son. I also think that part of Anne’s fascination is her elusiveness. There are only a limited array of primary sources pertaining to Anne, as Henry destroyed so many relics of her life. His attempts to destroy her memory were, of course, unsuccessful in the long run, but what we have now is a shifting, kaleidoscope image of a woman who has been cast anywhere from a “poisonous strumpet” to a valiant heroine. Even accounts of what she looked like differ enormously, from a six fingered witch to a radiant beauty. Of course, as you pointed out, most accounts describe her as a comely woman of no exceptional beauty, but with exquisite dark eyes. More significantly, no one truly knows what she was like as her own words have nearly all been wiped from history, save her death speech. So everything we know about Anne Boleyn is channeled through hearsay and the opinions (biased or not) of her contemporaries. The other wives are quite easy for modern scholars and history enthusiasts to label. Catherine of Aragon–the pious, wronged wife; Jane Seymour–the gentle, obedient pawn (though you pointed out discrepancies with that image), Katherine Howard–the teenage adulteress. But opinions on Anne differ so extraordinarily that there is no one interpretation of her. My personal image is one of an extremely courageous, fiery young woman with great ambition, political and social intelligence, and charisma, countered by flaws of impatience and a hot temper. I think she was capable of being cruel and had a sharp tongue–as shown in her derision and fear of Mary I. On the other hand, she was said to be a loving and gentle mother to Elizabeth I. But, the stress and terror of her situation cannot be overemphasized. I think she was incredibly human and stunningly vivacious. Whatever the case, she was no pliant English rose.